© 2003, © 2018 by Paul Freeman. Revised 10/17/18. 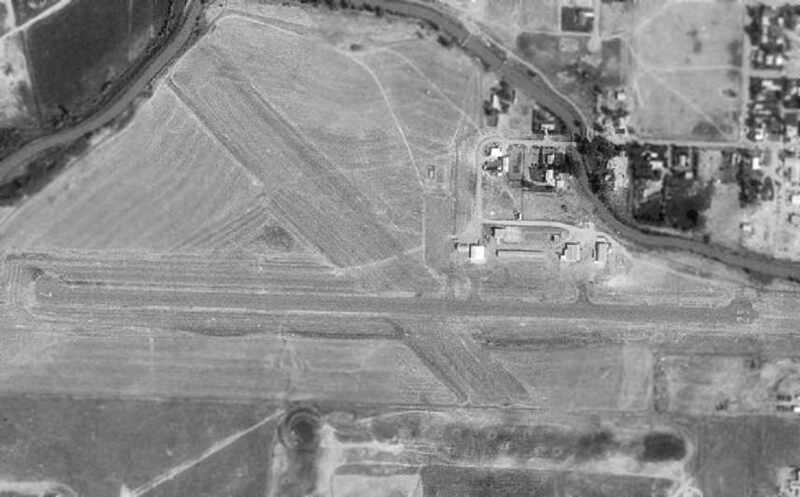 An 8/4/72 USGS aerial view of the original Broadus Airport. The original airport for the town of Broadus was located on the southwest side of the town. The date of establishment of the original Broadus Airport has not been determined. 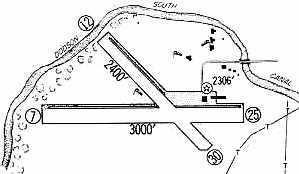 The earliest depiction of Broadus Airport which has been located was an 8/4/72 USGS aerial view. It depicted Broadus as having a single paved northwest/southeast runway, with a few small buildings on the east side. with a few small buildings & an airway beacon on the east side. 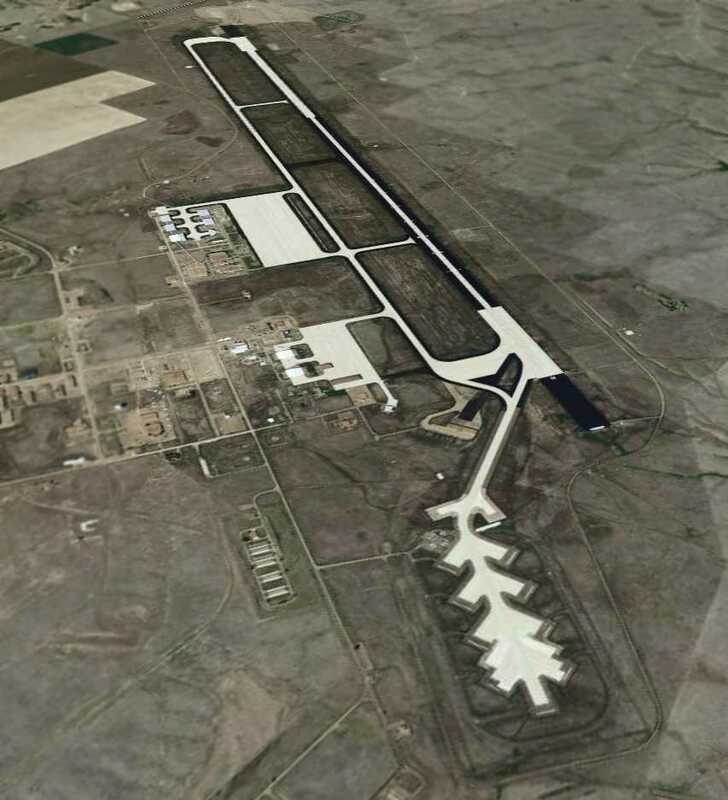 A 1996 USGS aerial view looking northwest depicted 4 single-engine aircraft on the Broadus Airport ramp. which showed 2 single-engine aircraft on its ramp. and had a single 3,150' asphalt Runway 11/29. at which point presumably the old Broadus Airport was closed. though the runway was marked with closed-runway “X” symbols. The site of the old Broadus Airport is located at the southwest terminus of Airport Road, appropriately enough. 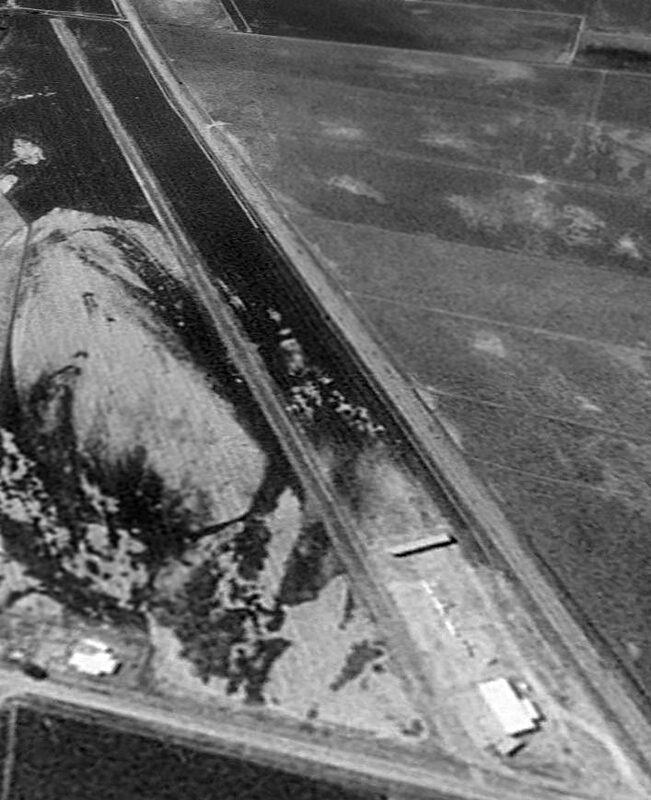 An 8/30/75 USGS aerial view of Oscar's Dreamland Airfield. Oscar Cooke was a barnstormer in the 1920s & 1930s, flying his plane throughout Kansas. He eventually opened up a museum of farm life which included at least one aircraft. as it was not yet depicted on the 1969 USGS topo map nor on a 8/27/69 USGS aerial photo. 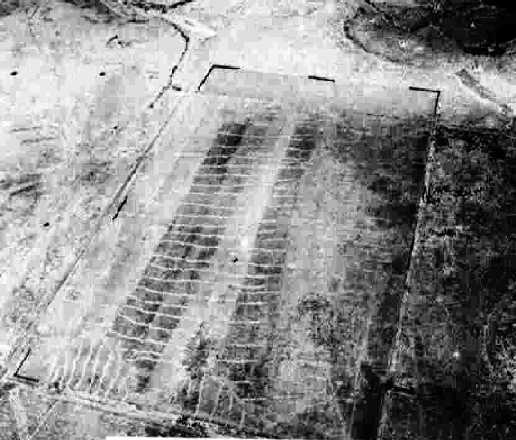 The earliest depiction of Oscar's Dreampark Airfield which has been located was an 8/30/75 USGS aerial photo. with a single building on the northeast side. 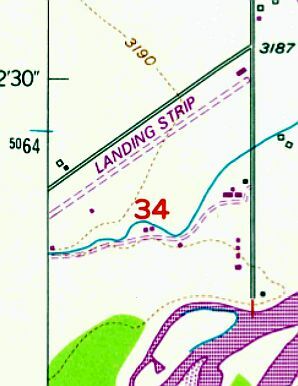 labeled simply as “Landing Strip”, with a single building on the northeast side. 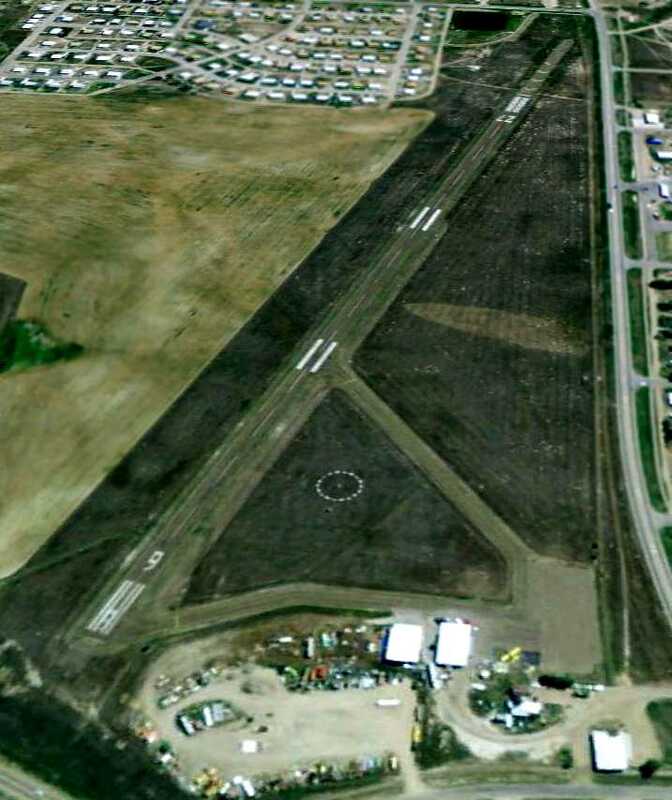 described “Airpark Oscar's” as having a single 3,070' asphalt Runway 3/21. was on the 1991 Cheyenne Sectional Chart (courtesy of Jonathan Westerling). 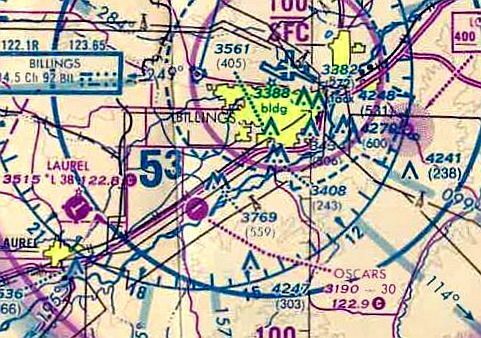 It depicted Oscars as a public-use airfield with a single paved 3,000' northeast/southwest runway. 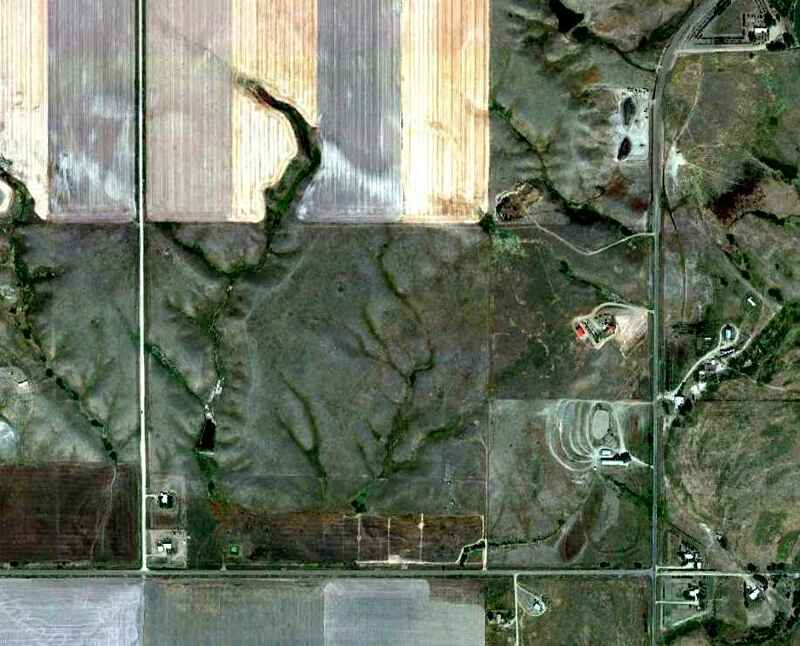 was an 8/22/96 USGS aerial view looking west. 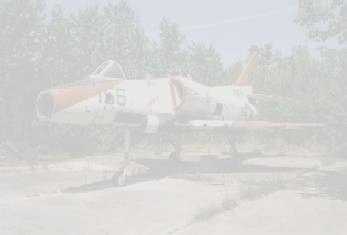 It depicted 4 single-engine aircraft parked next to the hangar on the northeast side of a paved runway. due to a forced sale of the antique collection to settle I.R.S. Inheritance taxes. The airfield was presumably closed at the same time. An 8/12/11 aerial view looking west showed that the northeastern half of the Oscar's Dreamland runway remained, along with the hangar. The site of Oscar's Dreamland Airfield is located southwest of the intersection of Wise Lane & Story Road. A 9/23/43 aerial view looking north at Poplar Municipal Airport from the 1945 AAF Airfield Directory (courtesy of Scott Murdock). The original airport for the town of Poplar was located on the northwest side of the town. The date of establishment of Poplar Municipal Airport has not been determined. was a 9/23/43 aerial view looking north from the 1945 AAF Airfield Directory (courtesy of Scott Murdock). It depicted Poplar as consisting of a simple rectangular unpaved airfield, without any other improvements. 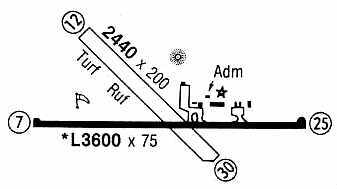 as a 123 acre rectangular field, having a 2,710' x 1,940' sod field. 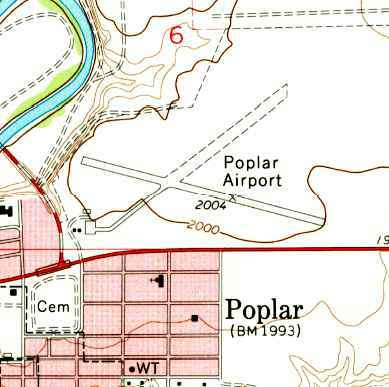 as that was the only Poplar Airport depicted on the 1954 USGS topo map. 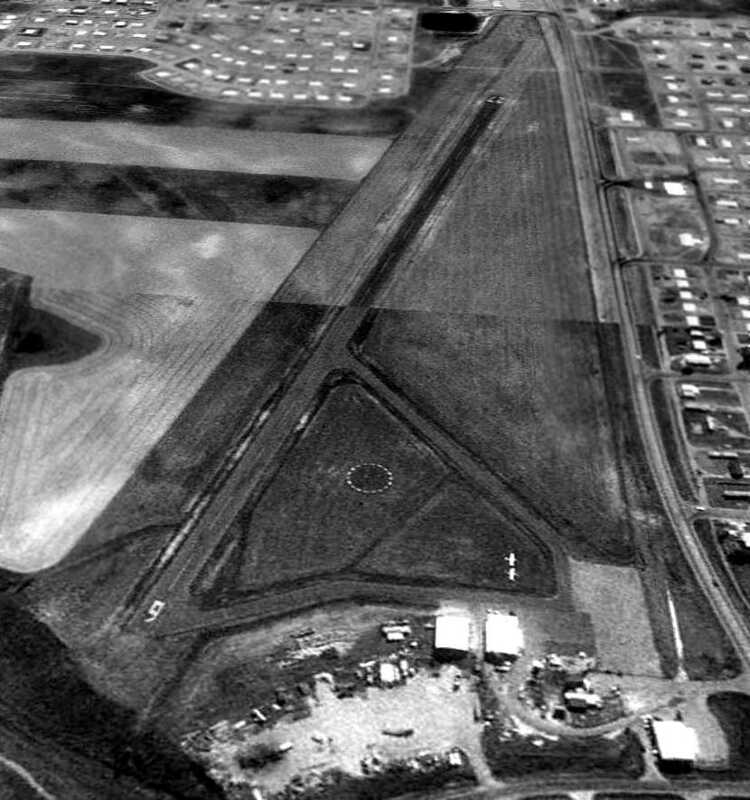 No airfield remains of the original Poplar Municipal Airport were recognizable on the 1996 USGS aerial photo. 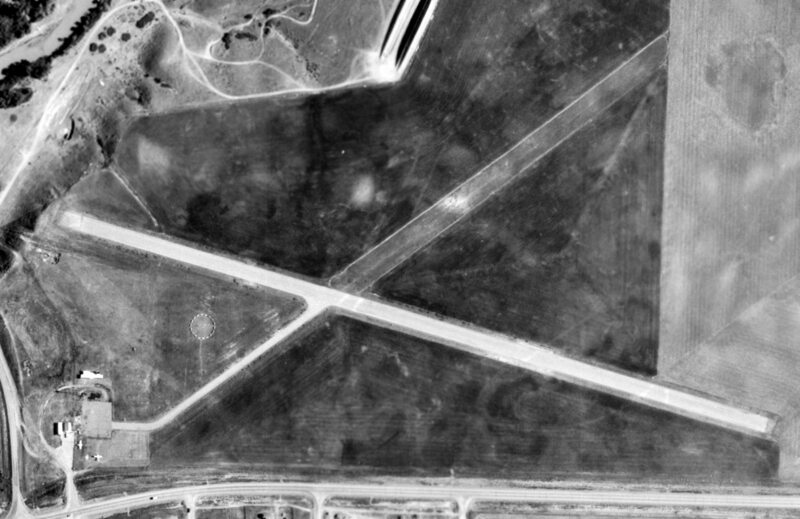 In a 9/10/10 aerial photo, no trace remained recognizable of the original location of Poplar Municipal Airport. The site of the first location of Poplar Municipal Airport is located northwest of the intersection of Poplar River Road & Red Thunder Road. 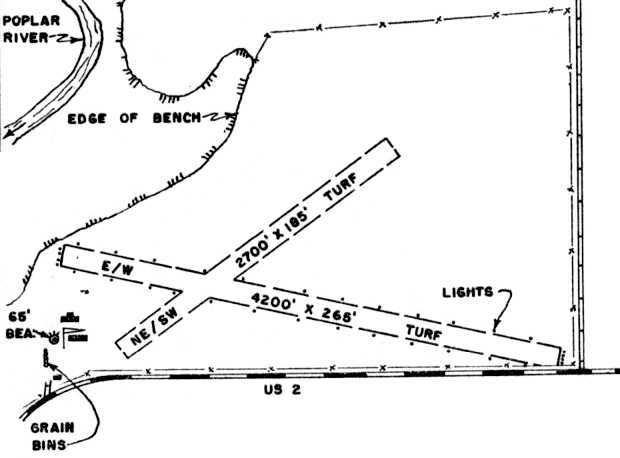 The 2nd location of Poplar Airport, as depicted in the 1961 MT Airport Directory (courtesy of Ron Dupas). 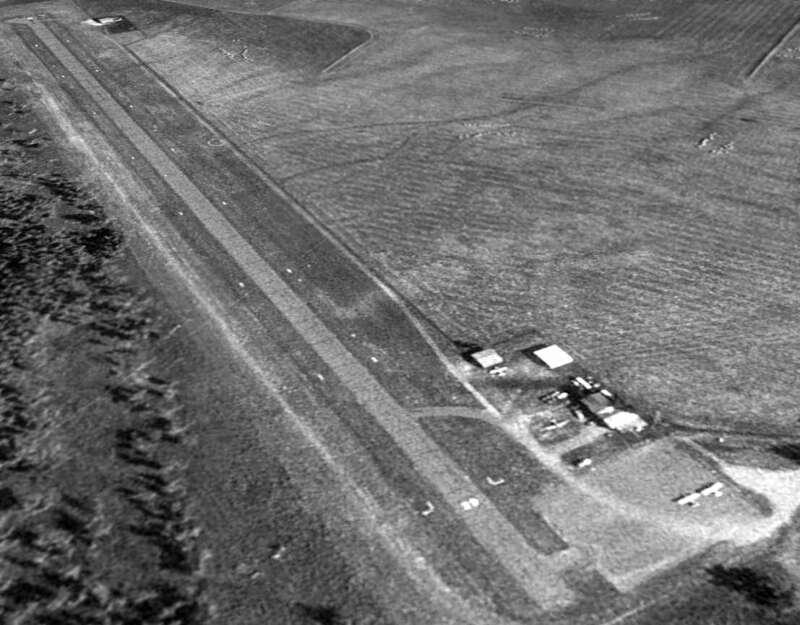 At some point between 1945-61, the original Poplar Municipal Airport was replaced by a more-substantial airport located adjacent to the northeast side of the town. in the 1961 MT Airport Directory (courtesy of Ron Dupas). with 2 buildings & a beacon tower on the southwest side. 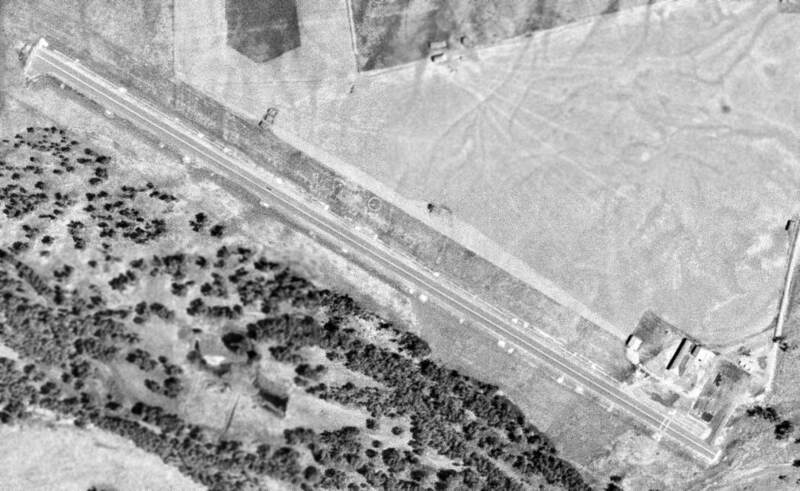 The earliest photo which has been located of the 2nd location of Poplar Airport was a 7/15/71 USGS aerial view. It showed that Poplar's northwest/southeast runway had been paved at some point between 1961-71. Two light single-engine aircraft were visible on the ramp on the southwest side. 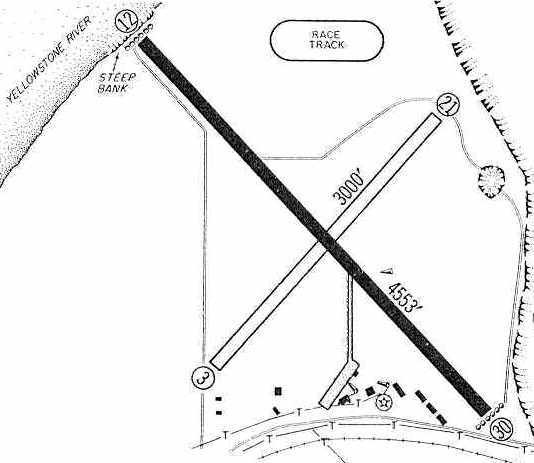 The 1972 USGS topo map showed that Poplar's northwest/southeast runway had been paved at some point between 1961-75.
to have a paved Runway 9/27, with the former crosswind grass runway being barely recognizable. A taxiway led to a ramp & several small buildings on the southeast side, and 2 single-engine aircraft were visible. At some point between 2007-2009 a somewhat larger replacement Poplar Airport (its 3rd location) was built only 1 mile to the northeast. showing a solitary yellow single-engine aircraft on the field. The housing development on the east side was intruding farther toward the field. 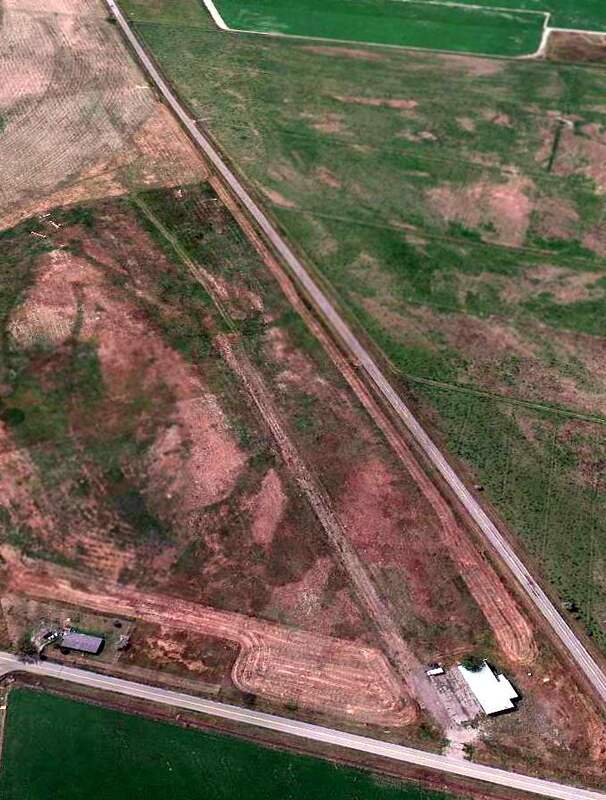 A 9/10/11 aerial view looking east at the 2nd location of Poplar Airport showed that the western portion of the runway pavement had begun to be removed. The airport buildings & other pavement remained intact, at least for the time being. The site of the 2nd location of Poplar Airport is located northeast of the intersection of Route 2 & Dark Road. on the October 1945 Milk River World Aeronautical Chart (courtesy of Chris Kennedy). as it was not yet depicted at all on the September 1944 Williston Chart (according to Chris Kennedy). was on the October 1945 Milk River World Aeronautical Chart (courtesy of Chris Kennedy). It depicted Veseth as a commercial/municipal airport. as that is how it was depicted on the May 1948 Williston Sectional Chart (courtesy of Chris Kennedy). 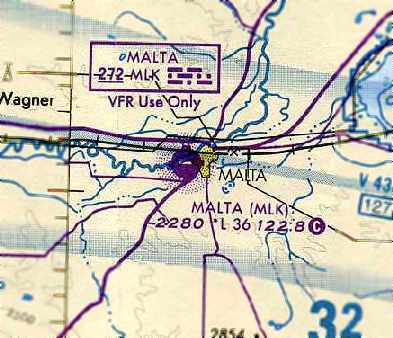 depicted Malta as having 2 unpaved runways: 3,000' Runway 7/25 & 2,400' Runway 12/30. A note cautioned that the runways were rough. Several buildings (hangars?) were depicted on the northeast side of the field. 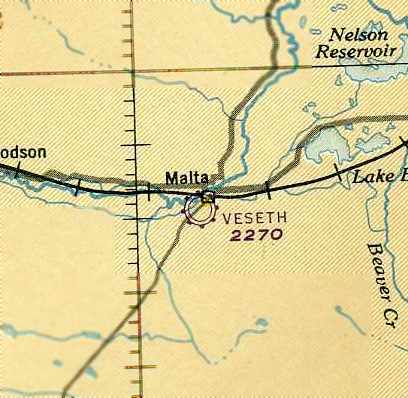 depicted Malta as having a 2,800' paved Runway 7/25, along with a 2,400' Runway 12/30. along with a few small buildings on the northeast side of the field. depicted Malta as having a 3,600' paved Runway 7/25, along with a 2,440' Runway 12/30. The field was noted to have operations by helicopters & crop dusters. The operators on the field were listed as Mendel Flying Service & Russ Aero Flying Service. A Non-Directional Beacon was depicted just north of the runway intersection. The 1996 USGS aerial photo depicted Malta as having a paved east/west runway & an unpaved northwest/southeast runway. but not a single aircraft was visible on the field. was on the September 1997 Billings Sectional Chart (courtesy of Chris Kennedy). along with its own Non-Directional Beacon. According to Alan Bradley, “A new airport, M75, was built on the northwest side of town. Hitch Aviation relocated as did the based aircraft. This happened in about 2002. The new field has 2 GPS approaches & looks like it will be less hemmed in by the town. A 7/13/03 aerial view depicted closed-runway “X” symbols painted along the runway of the original Malta Airport. 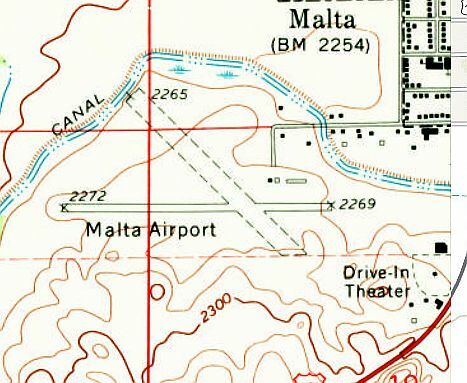 The original Malta Airport was no longer depicted at all on the March 2004 Billings Sectional Chart (courtesy of Chris Kennedy). A 1/1/05 aerial view did not depict any change in the status of the original Malta Airport. showed that the former runway was evidently reused for drag racing at some point between 2005-2009. 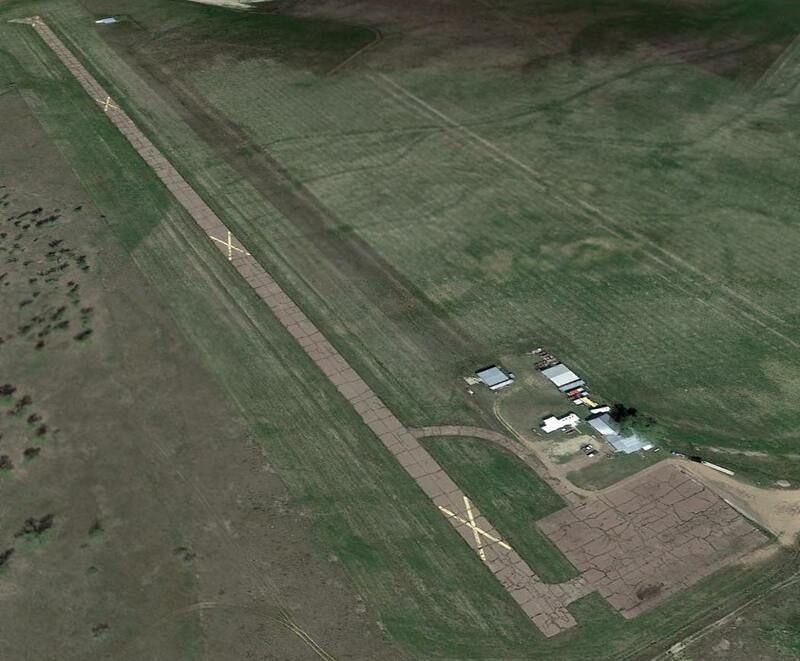 The unpaved crosswind runway was still apparent, and the former hangars remained standing. 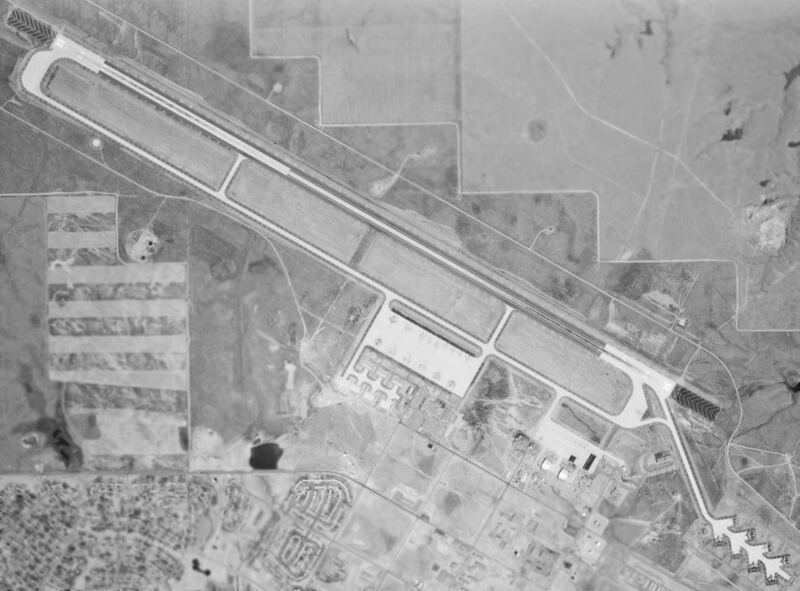 The original Malta Airport is located northwest of the intersection of Interstate 94 & North Merrill Avenue. Glendive was depicted as a commercial/municipal airport on the June 1935 Sectional Chart (courtesy of Ken Meintzer). This general aviation airport apparently dated back to before 1933.
was in The Airport Directory Company's 1933 Airport Directory (courtesy of Chris Kennedy). having three graded, rolled runways (with the longest being the 3,500' northwest/southeast strip). The field was said to have a hangar, and to offer fuel. was on the June 1935 Sectional Chart (courtesy of Ken Meintzer). 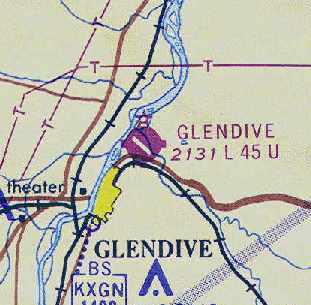 depicted Glendive as an auxiliary airfield. along with a 3,000' unpaved Runway 3/21. 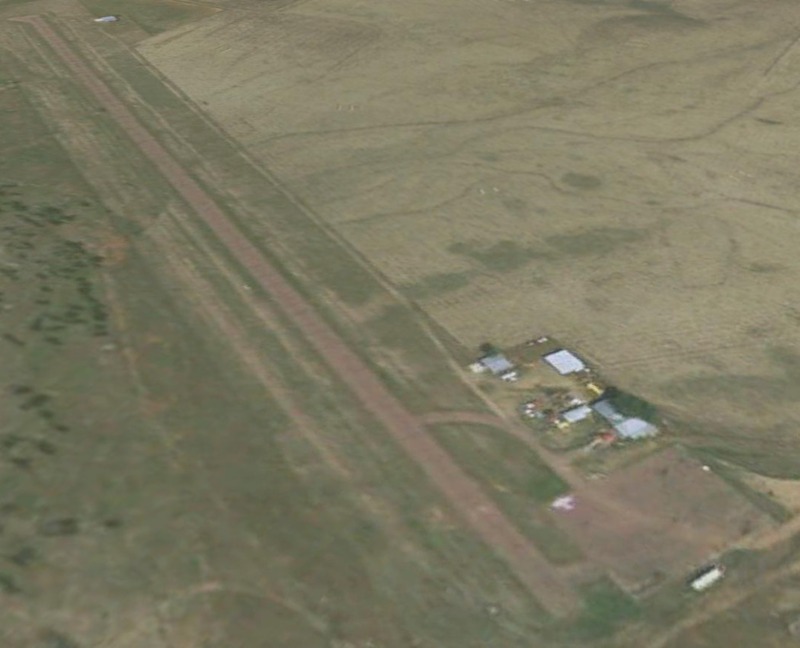 A taxiway led to a ramp on the south side of the field, with numerous small buildings (hangars?). but no longer depicted the unpaved crosswind runway. 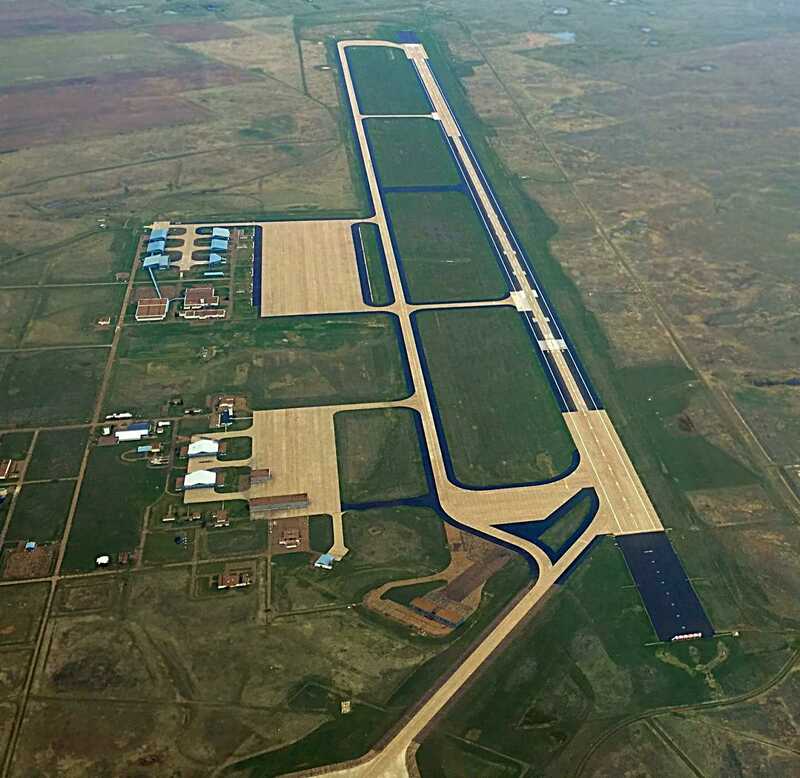 depicted Glendive as having a 4,500' paved runway. 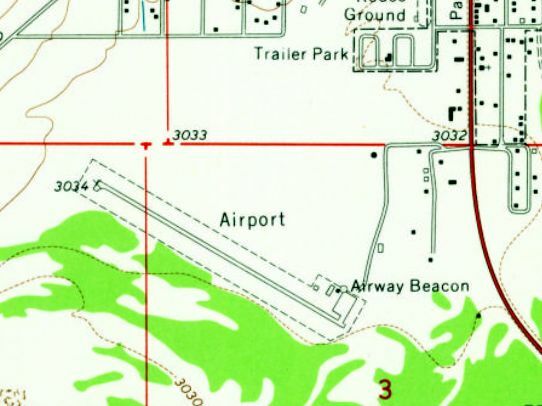 as it was depicted as “Abandoned Airport” on the October 1969 Miles City Sectional Chart. which was located in farther out & offered more space for multiple paved runways. 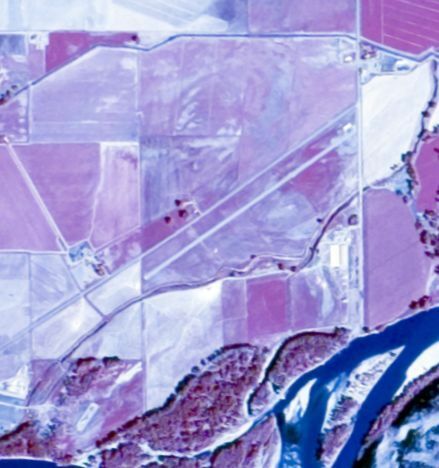 A 1996 USGS aerial view looking northeast at the site of Glendive Municipal Airport showed the outline of most of the paved runway was still quite recognizable. However, much of the former airport site has been covered by baseball diamonds & several new buildings. It is not known if any of the smaller buildings on the south side of the property date from the site's days as an airport. but other portions of the airport site had been progressively covered by new construction between 1996-2016. 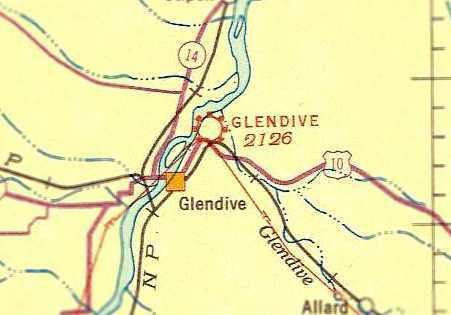 The site of the Glendive Airport is located northwest of the intersection of Interstate 94 & North Merrill Avenue. An undated (circa late 1950s-60s) photo of an F-101B Voodoo of Glasgow's 13th FIS, over a typically snowy Montana landscape. 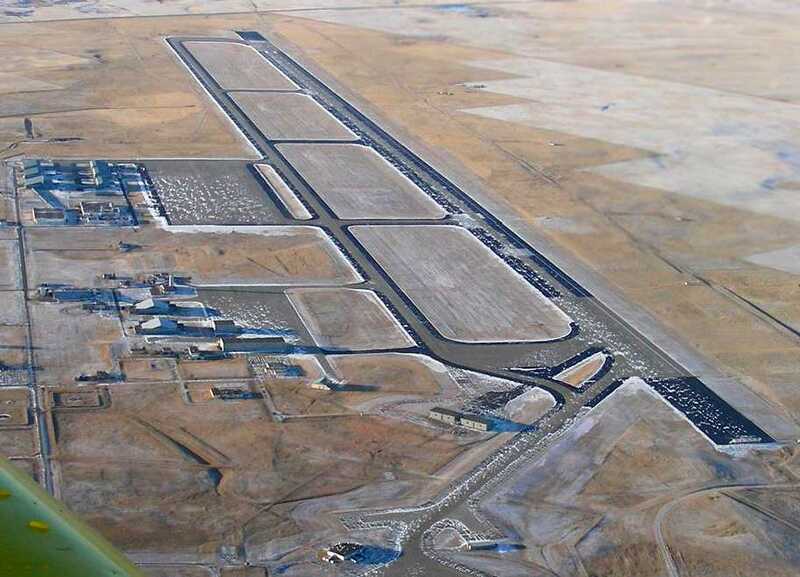 Construction began on this massive airfield in 1955.
which initially operated from a single 8,900' runway. 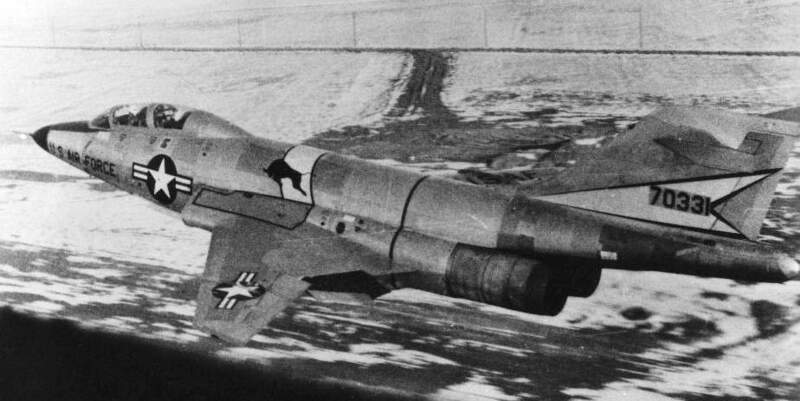 and the 13th Fighter Interceptor Squadron from 1959-68, which were equipped with the F-101B Voodoo. 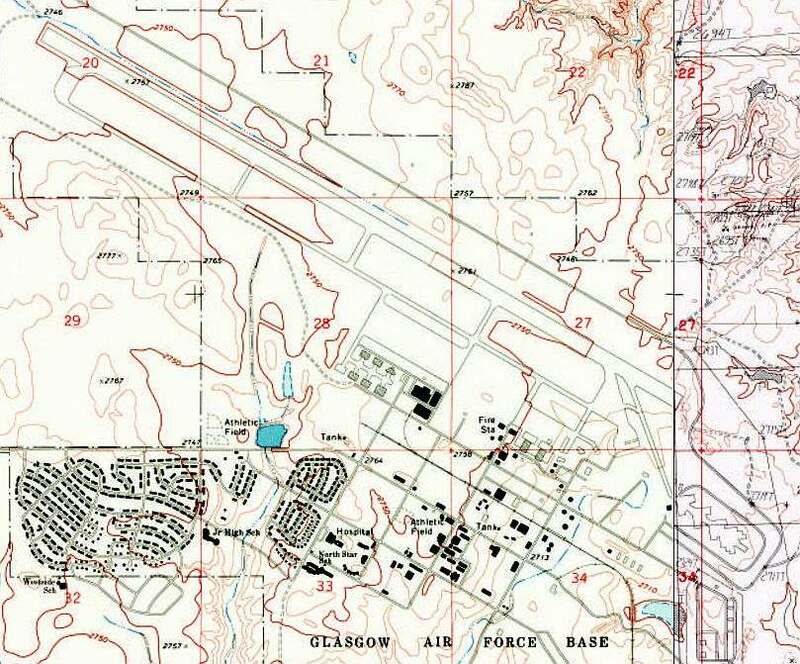 Glasgow AFB was not yet depicted on the 1958 USGS topo map. and its runway was significantly expanded to 13,500' in length to support the coming operation of B-52 bombers. 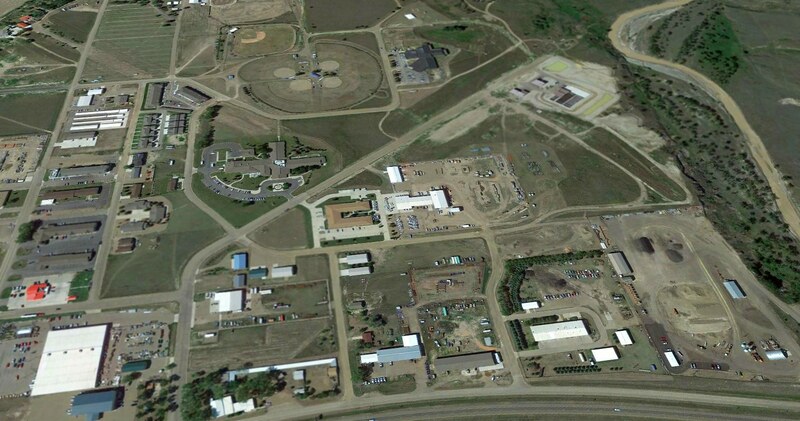 moved to Glasgow Air Force Base as the nucleus for the organization of the 4141st Strategic Wing. In its first year, this became the top wing in the 15th Air Force. which operated B-52C & B-52D bombers & KC-135 tankers. 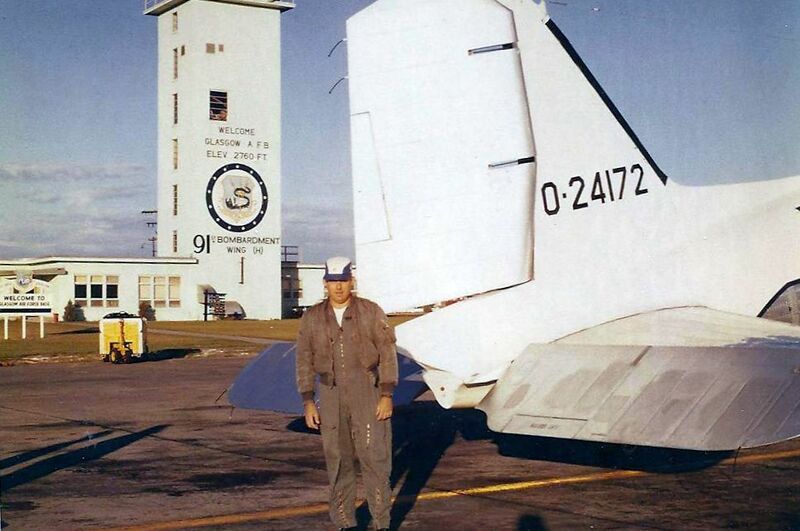 Charles Stapleton recalled, “I was stationed at Glasgow AFB from 2/27/62 - 3/13/65. (assigned to the 91st Bombardment Wing at Glasgow). 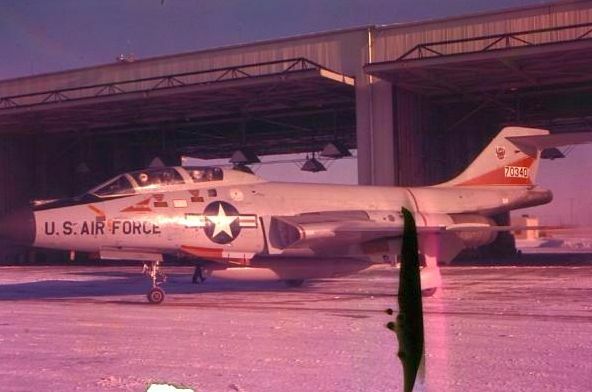 A mid-1960s photo of a 13th FIS McDonnell F-101B Voodoo interceptor in front of a Glasgow AFB hangar. A 1965 photo of a 13th FIS McDonnell F-101B Voodoo interceptor taxiing at Glasgow AFB. A 1965 photo looking northwest from Glasgow AFB's MG-13 radar shop at McDonnell F-101B Voodoo interceptor inside the 13th FIS hangars. was on the July 1965 Williston Sectional Chart (courtesy of Ron Kunse). 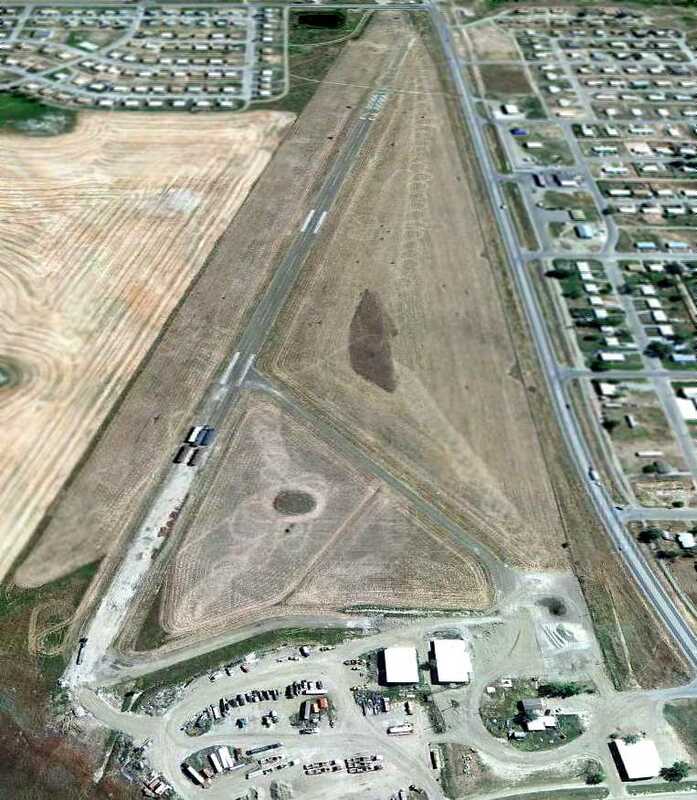 It depicted Glasow AFB as having a 13,500' paved northwest/southeast runway. in the direction that ADC interceptors would be expected to scramble to intercept hostile bombers. 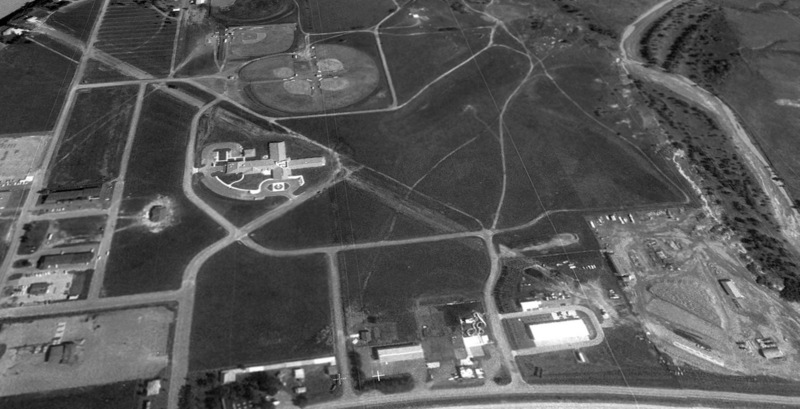 A 7/23/67 USGS aerial view of the massive Glasgow AFB. 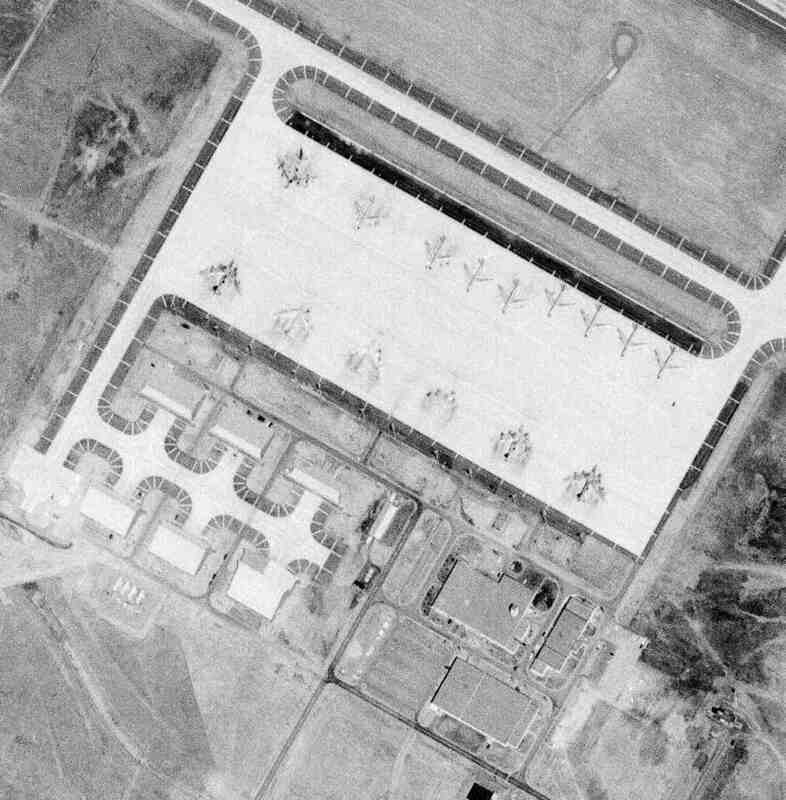 A closeup from the 7/23/67 USGS aerial view showing B-52 bombers & KC-135 tankers on the Glasgow AFB ramp. 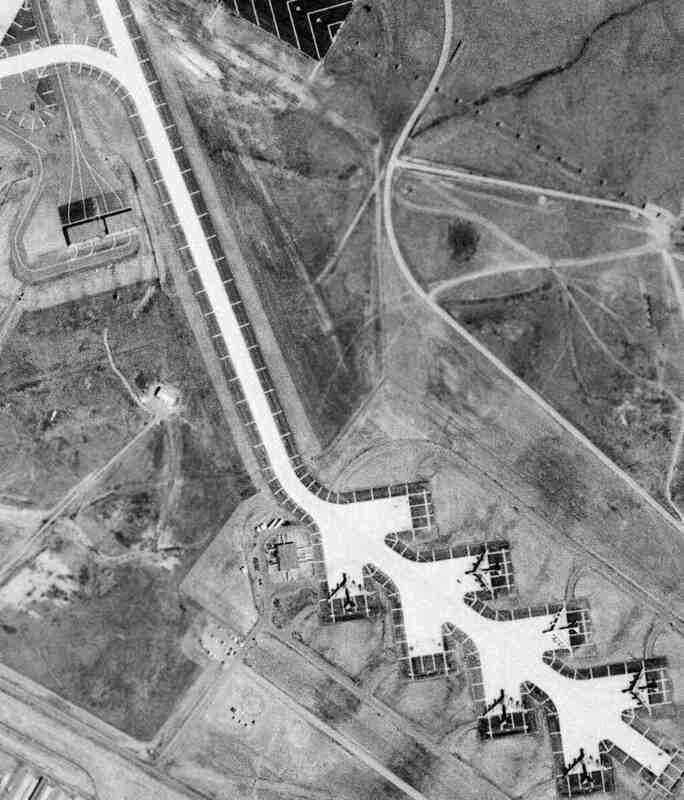 A closeup from the 7/23/67 USGS aerial view showing B-52 bombers on Glasgow AFB's “Christmas tree” alert pad. A 1968 photo of the last plane flown out of Glasgow AFB before its closure: a vintage Douglas C-47 transport. Glasgow's 322nd Bombardment Squadron was inactivated in 1968. Glasgow AFB was closed in 1968, with this massive facility having been open for only 11 years. AVCO Economics Systems Corporation in the following year. 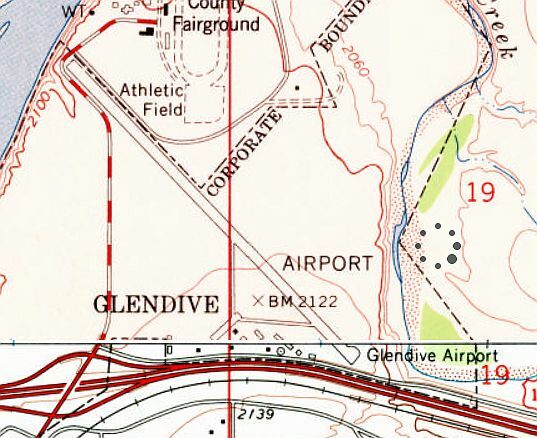 The 1969 USGS topo map depicted the extensive infrastructure of Glasgow AFB, one year after its closure. 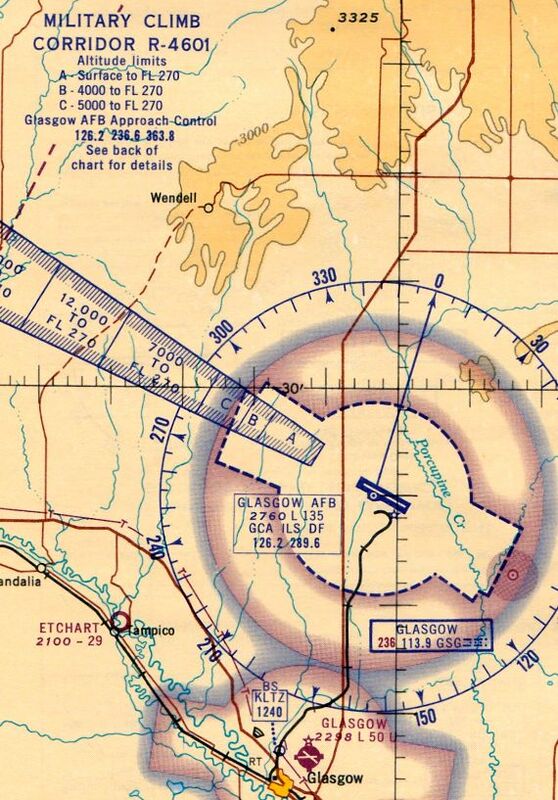 The 1971 Billings Sectional Chart labeled the former Glasgow AFB as “Avco ESC“, with a 13,500' paved runway. the runway surface, control tower & navigational aids. but this was never completed. 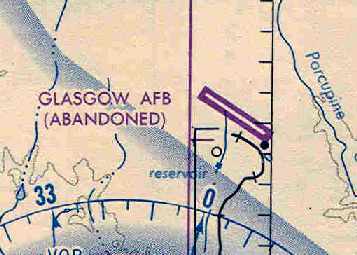 depicted Glasgow AFB as an abandoned airfield. it was so isolated & without business advantages that it sat idle for years. has been called "an example of failed local policies." a trend that continued among the civilian population. as that is how it was labeled on the April 1982 Billings Sectional Chart (courtesy of Paul Columbus). 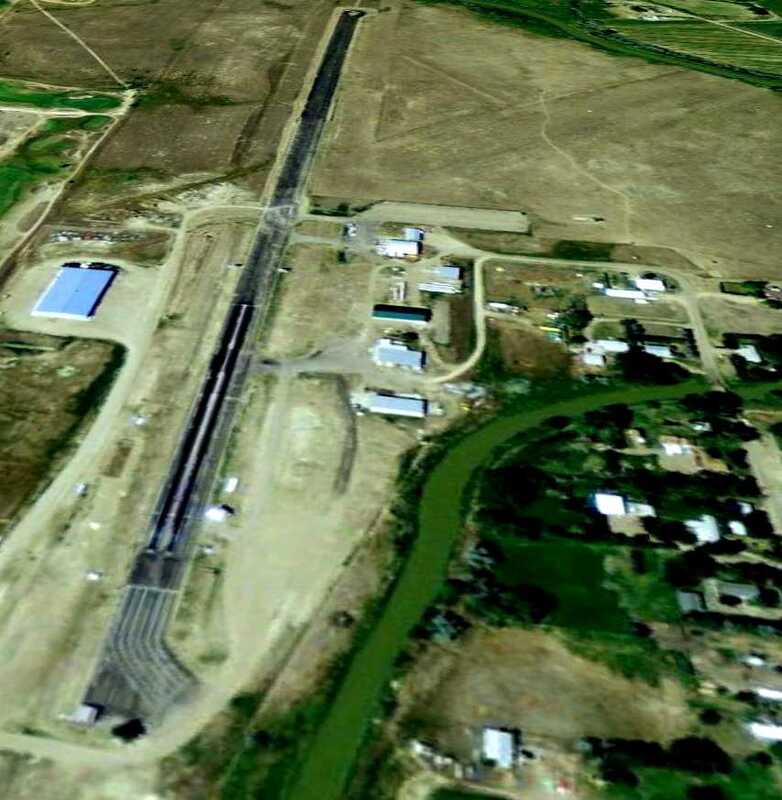 It depicted Valley Industrial Park as having a 13,500' paved northwest/southeast runway. 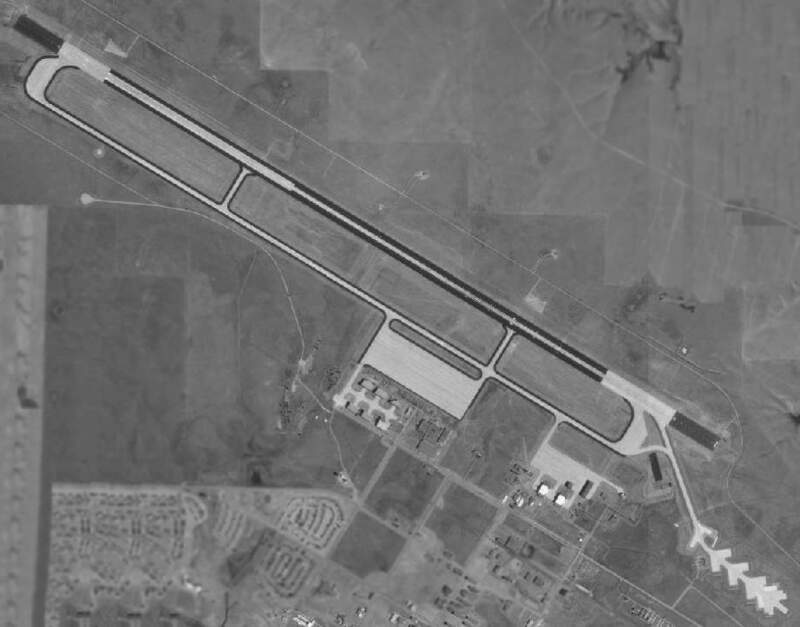 As of 1990 the Glasgow AFB base & all its infrastructure remained almost completely idle. A recent aerial view looking northwest along Glasgow's massive single runway. A recent photo of remaining military buildings at Glasgow. 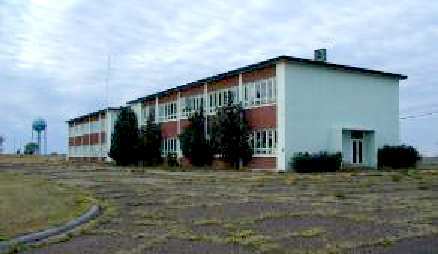 A 2001 photo of the former base headquarters building, by David Redman. A 2001 photo of the control tower & fire department, by David Redman. by a subsidiary of Boeing named "Montana Aviation Research Company". and still use it as of 2002 for airliner flight testing. 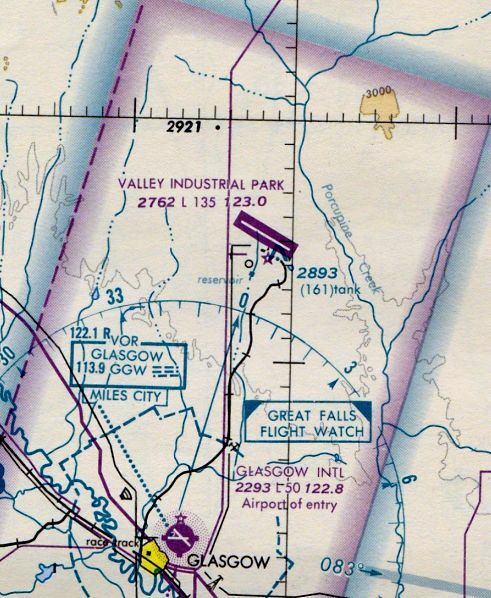 It is currently listed in the Airport Facility Directory as a private airfield named "Glasgow Industrial Airport". The published statistics list a total of only 30 aircraft operations per year. along with large ramp areas & 67 buildings (including numerous hangars). the first two examples of Boeing's new 777-300ER. which currently hold the title of the most powerful jet engines in the world. to complete these precision noise measurements much more quickly than normal, without any outside interference. but Embraer & Bombardier have also been carrying out flight tests & taxiing trials here on their new regional jets. were flown in from Seattle for the Boeing test programs. shortly before the touchdown zone", explained flight test director Jeffrey Scott. and after a short countdown we turn onto the final approach. This will entail taking up a precisely specified flight attitude, speed and rate of descent. Recording will begin after a ground signal. Later on we will check whether we have kept precisely to all the requirements." as these actually alter the sound propagation", explained flight test director Scott. For this reason, the meteorologists in Glasgow play an important role in the proceedings. and transmits this data to a ground station on the measurement field. and then the massive single runway. which previously served as an F-101B MG-13 fire control system calibration shelter used by the 13th Fighter Interceptor Squadron. A 2005 photo of a facility on the southeast ramp used for storage & maintenance of Falcon air-to-air missiles used by Glasgow's 13th FIS F-101Bs. A 2005 photo of a hangar just east of Glasgow's control tower. 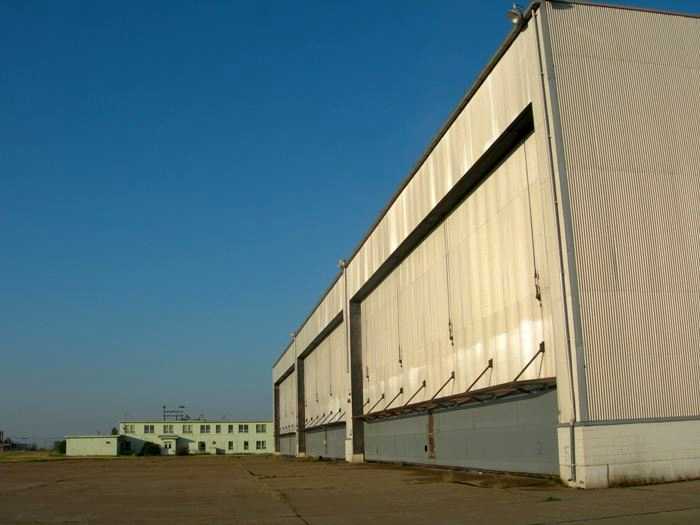 A 2005 photo of hangars on the southeast ramp used as "Ready Bays" for the 13th FIS's F-101B interceptors. The 2-story building at the left was the 13th FIS Operations Center. A 12/17/07 aerial view looking west along Glasgow's massive runway. On 8/24/12 Boeing flew a loaned American Airlines 737-800 (N897NN) to Glasgow for a 3 month program as their ecoDemonstrator. A 4/29/16 aerial view by Colin Graham looking west along Glasgow's massive runway.